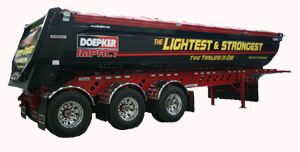 Doepker Industries Ltd is proud to announce that our patent pending Doepker IMPACT is officially a patented design (CA2690684). Our continuous industry changing designs are included in every trailer model we build. The result of continuously listening to customers in combination with our industry and design expertise always delivers a product that provides real and valued solutions within the industry. Lightest, strongest, longest lasting, easiest to use in addition to our creative and state of the art engineering is at the top of our list. Our Impact is no exception, it is another example.